One woman's stories, adventures, observations and rants, lived through and beyond metastatic breast cancer. "You know what would make this kale smoothie better? Get rid of the kale." "I've added flax to my green smoothie. Now, all I need is a protein." "Like a side of steak?" Really unappealing but tasty, I swear. A couple of weeks ago, I wrote about meeting with Heather, a cancer coach at the new survivorship centre. Her background is as a nutritionist and I have chosen to focus on that topic with her. She's impressed on me the importance of making small SMART goals. I've chosen to focus on getting at least 5 servings of fruits and vegetables every day for the next month (after which I will buy myself a small present, as directed by Heather). I was sure it would be laughably easy. Heather also gave me some recipes and encouraged me to try them as a way of increasing my consumption of fruit and vegetables. I tried a version of one yesterday with kale, mango and mixed berries. It was delicious but the blender didn't do a great job with the kale, leaving chunks of it to get stuck between our teeth (see first quote from Tim, above). 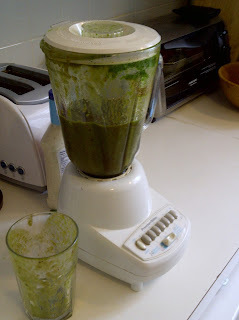 After a wonderful conversation on Facebook (it seems that lots of people find the topic of making green smoothies to be of passionate interest), I decided to put the water in first and blend the kale before adding the fruit. A video on "How Your Blender Uses Physics to Make a Smoothie" posted by my friend Hélène, was fascinating and very helpful. Today, I put water and the kale (more than yesterday) in first. This helped my blender to be much more effective. I added fruit gradually, until the bitterness of the kale was masked by the berries and mango. I also added a tablespoon of flax seed. The result wasn't pretty but it did taste pretty good. I also found out yesterday that my friends have very strong feelings about their smoothie-making appliances. It made me covet a new appliance but Tim has rightly suggested that I should wait until I have a proven commitment to smoothie-making. I think I'll ask for a Nutribullet for Mothers' Day. Andrea and others rave about it and it is the cheapest of the lot. It's bound to be less labour intensive than what I'm currently doing (I have to keep removing the lid and stuffing the unblended bits down). Also, there probably shouldn't be a burning smell when I'm done blending. I'd love to hear all your adventures and advice about smoothie making. Recipe advice would also be welcome, along with other suggestions (what do you use for protein, besides a side of steak?). Andrea shared a link to the Almost Raw Vegan, who has 50 recipes that look pretty good to me. *I've just figured out that flax seed is a great source of protein. See how little I know? The headline reads, "Breast cancer among young women increasing" and cites a study conducted out of the Adolescent and Young Adult Oncology program at the Seattle Children's hospital. I certainly know lots of young women with breast cancer (I worked with several of them but that's a whole other story). I also know and have known lots of younger women with advanced (or metastatic) cancer - which is really what this article from the Los Angeles Times is all about. As Rebecca Johnson (herself a survivor of breast cancer at 27) and her co-authors concluded, "An increasing number of young women in the United States will present with metastatic breast cancer in an age group that already has the worst prognosis, no recommended routine screening practice, the least health insurance, and the most potential years of life." I'm certain this is also true of Canada. This would be someone mitigated by our health care system (where young women don't avoid trips to the doctor due to cost) - I'd love to see a similar study replicated here. The article raises the question of what is causing this increase and, as is quite common, the issues of diet, exercise, birth control, late pregnancies - so called "lifestyle" issues - are cited as potential culprits. Why then do I know so many healthy, active, thin vegetarians who were diagnosed with very aggressive metastatic breast cancer? If we really want answers, must more research needs to be done. And this research must include a cold, hard look at environmental factors contributing to cancer. Think that will ever happen? I, for one, am not holding my breath. "Sometimes we need to do something not because it’s good for us or because we ought to but because it’s fun. And because it will put a smile on our face and on the faces of people around us." You can watch a great short video and read the rest of the post over at Frivolity. Click on the image to email me.